VILLAS AND APARTMENTS TO RENT IN VILLARICOS, SPAIN. Welcome to our selection of holiday homes to rent in Villaricos, Spain. Villaricos whose name means "rich village" because of the ancient silver mines in the area, is a small fishing village at the base of the Sierra Almagrera mountains by the Rio Almanzora and the on the southwest coast. Seafood restaurants are quite common in Villaricos serving fine fresh fish. Fishing is a way of life for the local community and the two harbours are usually a lively place that is currently undergoing development to accommodate the rise in tourists visiting the area. Despite its growth, Villaricos has kept to its traditional Spanish roots. The Mediterranean Sea gives the village a pleasant climate with hot summers and mild winters. There are two unspoilt beaches to go to - one is pebbled, coming up to the village while the other consists of golden sands with a beautiful secluded bay. The warm waters are always clear and perfect for diving. 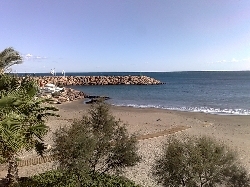 Looking for self catering holiday accommodation in Villaricos? Then below is a selection of holiday apartments in Villaricos and holiday villas in Villaricos that can be rented direct from their owners. You can either click on each listing for further details or you can use our search engine on the left if you are looking for something in particular.